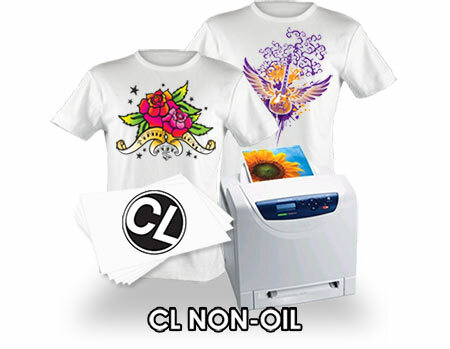 "CL Plus-N" Non-Oil Heat Transfer Paper is newly improved. Transfer times are shortened dramatically and this new generation heat transfer paper has lower pricing too. Color laser printers can be finicky when it comes to running transfer paper. This transfer paper is more forgiving than others and runs better through the fuser section with more consistent imaging results. This transfer paper offers great run ability, easy to press & peel, little visible background, soft hand & excellent washability! For use with white and light colored fabric, mouse pads, coasters, binders, etc (NOT RECOMMENDED FOR PUZZLES OR CARDSTOCK). CL Non-Oil transfer paper is an innovative single-sheet textile transfer paper developed with a higher melting point than standard transfer papers. This results in exceptional run-ability through a range of laser printers & copiers that do not use fuser Oil. Keep in mind the instructions for this new heat transfer paper has changed! Must be applied by Heat Press only! Instructions | Transfer Cutting Tips!